A briefing of the events of the morning by President Moon’s spokesperson Yoon Young-chan gives the impression it was a very convivial meeting between the two leaders. All talk is of the unscripted moment when President Moon momentarily stepped over the demarcation line and into North Korea. Blue House spox on how that unscripted moment happened: Moon said to Kim, “When do I get to visit the North? And KJU said, why don’t you just come over to the North side now?” And that’s what led to them popping over to the North for a few moments. The morning summit meeting has been completed and the two leaders will now be breaking for lunch separately. Kim Jong-un and his delegation will be crossing back over to the North to eat, before coming back over the border. China is watching the summit closely, with news of the meeting occupying most of China Central Television (CCTV) coverage today. Li Xiyu, a professor of politics and diplomacy at Sungkyunkwan University told the Chinese publication, the Paper, that it’s still too early to talk about reunification but that the two sides would remain committed to peace. Still, on social media Chinese internet users were excited about the prospect and drew comparisons to the possibility of China reuniting with Taiwan. Beijing claims that Taiwan, which has been ruled by its own government for decades, belongs to mainland China. While people around the world were gripped by live TV coverage of this morning’s historic handshake between Moon and Kim, the people of North Korea were not among them. According to Martyn Williams, who runs the North Korea Tech blog, state run TV did not broadcast the event. South Korea’s Yonhap news agency said just over a third of TV viewers in the Seoul area watched live images of the leaders’ greeting each other across the military demarcation line separating their countries. Amid the heady talk of a new bginning for the Koreas, there is some chatter about what reunification would mean for the countries’ economies, ie a huge bailout for the North by the South. The easing of tension and the possibility of a peace treaty coming on the horizon are bullish for the won [South Korean currency] and Kospi. However, it should be noted that prices did not have lasting weakness in the past during the periods of escalation, hence it’ll be difficult to imagine a new bullish trend emerging just from this. Australian Prime Minister Malcolm Turnbull has expressed doubt that the summit will bring any significant shifts. “We have had false dawns before on the Korean peninsula,” he said. Australian Foreign Minister Julie Bishop was equally hesitant to hail the meeting between North and South Korea as definite progress towards denuclearisation. Kim Chang Su from the Korea Institute for Defense Analyses said the opening greeting between the two leaders made him optimistic about the summit, particularly as the focus is on talks of “peace” rather that reunification of North and South. “So far these seem to be very open minded discussions, a sign that we are heading to a new era of peace,” he added. According a Reuters reporter, minutes before Kim entered Peace House, a North Korean security team conducted a sweep for explosives and listening devices, as well as sprayed apparent disinfectant in the air, on the chairs, and on the guest book. The money people obviously enjoyed seeing the two Korean leaders meeting today as the Kospi index in Seoul soared more than 1%. 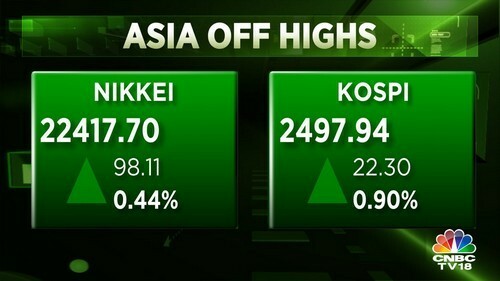 The Nikkei in Tokyo also looks healthy after rising 0.3% so far while Hong Kong is up 0.76%. The prices are off a little bit now from earlier highs, so perhaps the early gains were as much to do with a strong showing on Wall Street overnight. But what’s clear is that nuclear tension on the Korean peninsula is not a factor in dragging stocks lower, as it was a few months ago. Kim also revealed that he had brought Moon an edible gift from over the border. Kim and Moon sat down for the beginning of the summit and made brief remarks in from of the cameras. Japan’s defence minister, Itsunori Onodera, has said Tokyo hopes the summit will lead to demonstrable progress on North Korea’s missile and nuclear programmes, and a resolution of the regime’s cold war abductions of Japanese nationals. “Japan will be watching closely for signs that North Korea is taking action on these issues,” he said. Japan claims that 17 of its nationals – and perhaps many more – were abducted in the 1970s and 1980s and put to work teaching North Korean agents their language and culture. In 2002, five abductees were allowed to return to Japan. North Korea claimed that eight abductees died and that the remaining four had never entered the country. Japan’s prime minister, Shinzo Abe, has reportedly received assurances from Moon that he will raise the abduction issue with Kim at today’s summit.